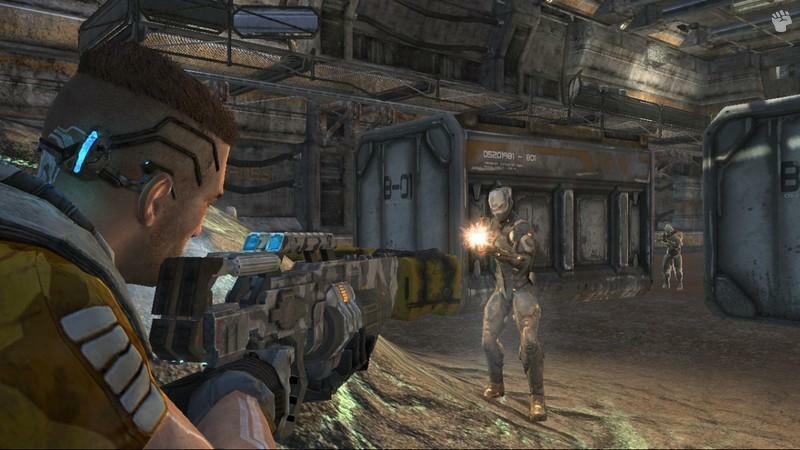 Fracture is the latest first person shooter epic from Lucasarts that is set in the not so distant future, the 22nd century to be exact as humanity has split into two factions. The Pacifians or those humans living on the West Coast have become obsessed in altering their DNA in order to keep abreast of the current climate conditions. However on the East Cost, the Atlantic Alliance have banned genetic engineer and use cybernetic technology to cope with the harsh futuristic conditions of earth. The Pacificans take this as threat and withdrawn themselves from the union and wage war on all whom oppose them. Fortunately for the denizens of the world, an elite soldier named Jet Brody is recruited to apprehend the Pacificans general and this is where the story of Fracture begins. The story may be clichéd, however it’s quite an entertaining storyline and Brody is a likeable character in a military “jock” way. 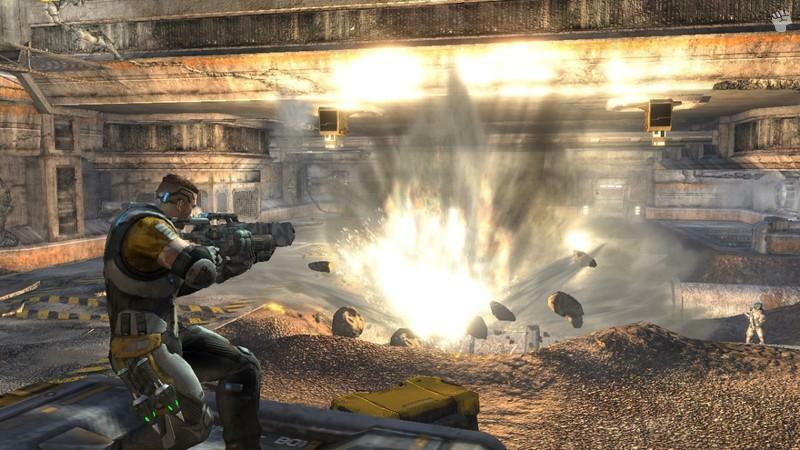 Truly next-generation gameplay – Groundbreaking terrain deformation allows players to reshape the battlefield on the fly with futuristic weaponry of the year 2161, allowing for unprecedented power, freedom and control. All new story and characters from the company that brought you Star Wars and Indiana Jones, as well as Mercenaries and Thrillville – Players assume the role of Mason Briggs, a demolitions expert in the mighty Atlantic Alliance army and the next great action hero. Plausible future conflict – As stem cell research continues to proliferate and spirals out of control, ideological differences over genetic enhancement place the player at the threshold of an epic battle of tomorrow between genetics vs. cybernetics as two powerful armies, with vastly differing tactics and advantages, square off. The battlefield will change forever. 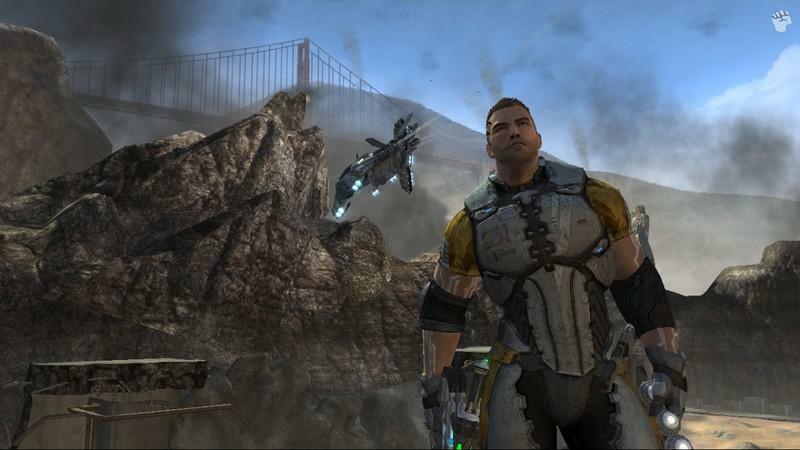 Although Fracture follows the stock standard first person shooter genre template, where the developers have raised the bar is through terrain deformation which allows the player to manipulate the gaming environment such as creating holes or even creating mountains to reach unreachable places or places to hide. The player also has access to a wide variety of different weaponry, all with a science fiction feel to them plus a few vehicles that can be controlled by the player. To succeed in Fracture you need to embrace the terraforming capabilities of the title which adds a twist to your gameplay as you utilise this interesting feature. For instance, terrain deformation allows you to kill your opponents by crushing them with large amounts of earth or even trapping them. Need some cover? Why not change the terrain in order to create a wall to prevent your enemies firepower from impacting on you. If you do happen to get injured which all gamers will, Fracture uses time to heal the game which allows for a much smoother gameplay style. The only downside to the terra deformation technology is that it does become a little repetitive and at the end of the day, Fracture then becomes your stock standard first person shooter set in the future where Earth is once again on the bridge of a mass war. The artificial intelligence of the game are quite impressive at times, especially some of the larger enemies that you face so you do need to be careful as you explore the gaming environment. My favourite weapon is the sniper rifle that allows for some great tactics as you perform headshot after headshot and if gore is not your thing, you may want to look elsewhere as the title is quite violent. 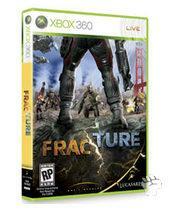 Once you have completed the single-player aspect of Fracture or if you feel a need to change, the multiplayer game is quite entertaining as you play a variety of traditional gameplay modes that include Death Match and King of the Hill for example. What the developers have added to the genre, especially with their terrain deformation capabilities is a new online mode called Excavation which has two teams battling it out for the largest spike as they attempt to move this into the atmosphere. Needless to say, it’s quite entertaining as you need to protect each structure from enemies as it can be destroyed but it’s definitely a fun part of the game. Graphically, the title is visually impressive on the XBox 360 with detailed gaming environment and some great character animations. The star of the game is the terrain deformation which allows you to move large amounts of Earth and reshape the face of the planet. It’s definitely one of the better special effects for the year. There’s even some great realistic special effects and weather effects that is pure eye candy at times. In relation to the soundtrack, Fracture sounds like it has been taken straight from Hollywood and suits the genre perfectly as it changes for certain parts of the game. The voice acting is a little forced at times but actually suits the over the top storyline and a match that with a variety of realistic sound effects and this game needs to be played loud to enjoy. In conclusion, Fracture did attempt to add something new to the first person shooter genre which works at times and at other times it doesn’t. It’s a good first person shooter and we could happily recommend it to the first person shooter boffin, especially if they are a science fiction fan. Definitely one to check out!